Neurotic, negative people – think Larry David or George Costanza – are more dangerous behind the wheel, according to new research from the Chinese Academy of Sciences in Beijing. 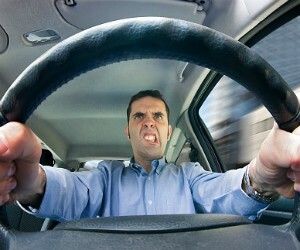 Previous research has found a correlation between angry and neurotic personalities, aggression, and an increased incidence of car crashes. But little research has investigated exactly why this is the case. To answer this question, psychological scientist Jing Chai and colleagues examined the brains and behavior of a group of dangerous drivers with a history of traffic violations and crashes. One explanation for why neurotic people are more dangerous drivers could be that they have a strong cognitive bias in the way they process emotional information. Individuals with a strong negativity bias react much more intensely to negative situations or feedback. This bias also influences the way people interpret events and social interactions. As demonstrated in a 2013 study conducted by Marcus Munafò and Ian Penton-Voak of the University of Bristol, people with a strong negativity bias tend to interpret ambiguous facial expressions as hostile or angry. Jing Chai and colleagues hypothesized that a strong negativity bias could influence people’s driving behavior. While an average person might not pay any attention to another car’s sudden lane change, someone biased towards perceiving negativity might assume that the other driver purposely cut them off. To test their theory, the research team recruited two groups of drivers: 15 bad drivers with at least six traffic violations on their records, and another group of 23 law-abiding drivers without a long history of traffic violations. Drivers from both groups came into the lab where they answered survey questions on their driving behavior, weekly driving mileage, penalty points and fines acquired within the last year, and any crashes during the last 3 years. For the rest of the experiment, participants were outfitted with EEG caps so the researchers could monitor their reactions on a neural level. Participants were then shown a series of negative or neutral images outlined with either a red or blue border. Neutral pictures included things like chairs or a desk, and pictures with negative emotional content showed scenes like an attacking snake or an injured child. The participants were instructed to ignore the content of these images, and to respond based only on the color of the picture’s border by pressing one keyboard key for red and another one for a blue border. The results revealed distinct differences, both behavioral and neural, between the two groups of drivers. Dangerous drivers took longer to categorize the images compared to the group of safe drivers, indicating that dangerous drivers were more sensitive to processing negative information. The EEG results provided more evidence that there were emotional processing differences between the two groups. This contrast suggests that the dangerous drivers had more difficulty tuning out the negative stimuli compared to the safer drivers. “Interestingly, a significant relationship between negativity bias and the number of crashes within the past three years was also found. The strong bias group had been involved in a greater number of crashes than the weak bias group had,” the researchers conclude.